Spring and fall are great times to deep clean your home! The beginning of each season is a time to de-clutter and start fresh and new! Depending on the size of your home, not all the tasks listed may be completed when time is limited by the customer. We will do our best to complete as much as possible within the time frame we are allotted. Fall is a great time to get your home ready for the holidays! Get a kick start before the holidays with a fall deep cleaning. This is a great time to try our state of the art Hygenitech mattress sanitizer. Our technicians can sanitize all of the beds in your home so you can sleep easy knowing that the dust mites are gone! It’s also a great time to deep clean your floors, the tops of your cabinets and moldings, your oven and stove, door knobs, light switches and really get to all of the nooks and crannies of your home where dirt hides. We can do it all! The holidays are a great time to reconnect with your family and friends. Why spend your time cleaning when Dial A Maid can do it for you. Enjoy yourself while we get your home in holiday ready shape! We know that the holidays can be stressful and there never seems to be enough time to do everything you want to do. 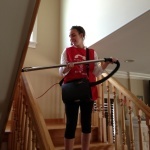 Let our professionals clean your home from top to bottom. We would be happy to clean your refrigerator, oven stove, floors, counters, cabinets, bathrooms, and bedrooms. We also can polish your silverware so that you can sit back, relax, and enjoy the holiday! Give us a call for special holiday packages available for yourself—or to give as gifts! A clean house by Dial A Maid never goes out of style!